Occasionally, it gets cold in my corner of California. The yarn has been in my stash for a million years. It's a bit rustic, shall we say? It was sheepy and interesting and it's going to be a while before I know what I think about it. I do know I'm glad that it's Mitten Month and I am therefore off the hook for a bit when it comes to whether or not there will be a matching hat. 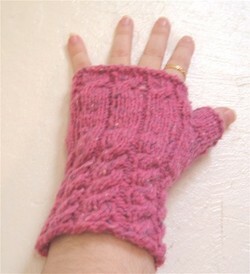 While I was waiting for the mittens to dry (and for the frost to arrive), I crankied out a pair of fingerless mitts. I know. It's a crap photo. I've never been good selfies. Shut up. Two strands of sock weight yarn held together. Extra long fingers that can be folded back when necessary. 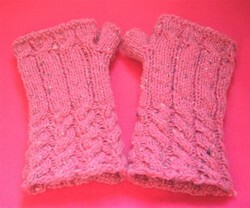 They are surprisingly warm and I may need to knit myself a pair as this pair went to my mum. 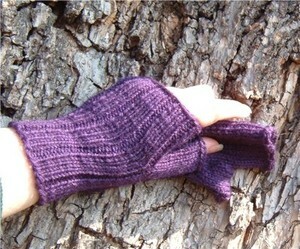 My favorite thing about those mitts is that the ribbing on the thumbs are perfect. You can't tell where I picked up stitches. It's a tiny detail that no one will ever notice but, for me, it's a sign that I am getting better at this glove/mitten/mitt business. For me, if the skill set isn't improving I'm in trouble. Like everything is white, sparkling and crispy in the morning cold. Like I had to knit me mitts so my fingers would not fall off while I scrape ice off the car cold. No, not with a credit card. I've moved on to a real ice scraper thingy. Thank you very much. I showed them off at my LYS this morning and the ladies loved them. In fact, they were surprised to learn that I had used sock yarn because of how lovely the fabric is. Maya was thinking silk blend. While my nails are a mess, I am calling this one a win. & I'm not just saying that because they are keeping my fingers from falling off. Oh! And the thing about TypePad? Yeah, looks like it was just a fluke thing because it hasn't happened again and my girlie at TypePad said they weren't doing anything yesterday to mess with my world. Trust me to be at the wrong place at the wrong time. Speaking of timing, anyone else watch Alice on Syfy? It was a two part four hours in total thingy and I thought it was lovely. I may be saying that because I have a HUGE thing for Andrew Lee Potts, but whatever. You have NO IDEA how hard it is to find people my type. & Have a lovely Tuesday. I used US 7 DPNs and a three by one rib on 32 lonely little stitches. I made the second one while watching Much Ado About Nothing. I'm not sure why, but I love that movie. Something about happy endings, I guess. Must be PMS time again. It is the first paperwhite bulb to bloom this year. 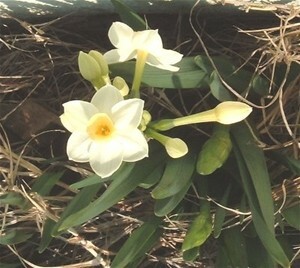 They are narcissus tazetta and/or daffodils. They mean spring to me. We're not done with winter yet, not by a long shot, but they are a wonderful yearly reminder that the green things are coming and Mother Nature's rebirth is on it's way. Should we bet on which cold knit blogger will arrive here to poke me first? I'm thinking The Norma, but Margene does live closer and Stacey wants my sunshine and is closer still. In other news, if you ever wonder what's a better purchase... a crock pot or a rice cooker, FFS get the crock pot! Most people don't eat enough rice to need a rice cooker... and certainly not a SIXTEEN CUP rice cooker. And stuff I knit last year, but couldn't share because they were gifts. That whole surprise thingy, ya know. Today's pair were knit for KnittyOtter* because she's too busy to eat lunch. Forget knitting. I used a yummy alpaca and wool yarn from Cabin Cove Mercantile. It is soft and lovely to work with and I'm still not totally sure how I let them out of the house. Remember when I was whining about the knitpicks sock yarn that was knitting up strangely? Half the sock was the dark color and the other half was light? Yeah, these socks are made out of that yarn. I gave up over-thinking and made them toe-up. So much easier, faster and knitter friendly. They are a basic short row toe and heel sock with a two by two... I think... rib. It was last month. Cut me some slack, peoples! In sweater news, I have started to hate it. I was thinking about frogging the whole damn thing last night, but wasn't sure what I'd do with all that yarn. I keep telling myself that it's about time I knit a sweater and once it's done, it's done and over with. See! Still an emotional knitter. In closing, I got nothing but sweater relationship issues and a stress headache. 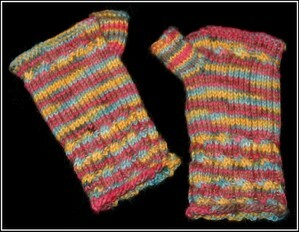 One ball of Queensland Collection Kathmandu Aran did indeed make a pair of Fetching fingerless mitts. My slightly longer at the wrist version, no less. My fingers aren't really that short, btw. You try to take a picture of your own hand and see how easy it is. I love them and really want a sweater out of that stuff. Time served was two days. I cast on 40 stitches because 45 was too big. Think oversized sleeve. I used US 7 bamboo DPNs and finished them last night while watching Four Weddings and a Funeral. Love the pattern and will do it again. Soon. Someone *cough*KnittyOtter*cough* sent me the yarn to make her a pair. One day, I'll make friends with that camera, but not today. Today is for enjoying my mitts and figuring out where I can meet a sugar daddy that's good at math*. Oh, and could someone please take pity on me and say something nice about the cables? It's a rare day when I remember to get them all going in the same/right direction.